Experts agree, there's a huge difference in quality of HDMI cables available on the market, and this difference is usually reflected in price. 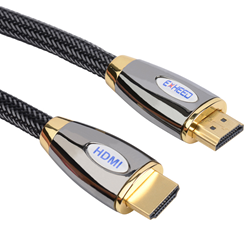 Electronics accessories company EXHEED® recently announced the release of their latest product, which is aimed at closing this gap, the EXHEED® Pro Series Premium Braided Shield Gold Plated HDMI 2.0 Cable. The new HDMI cable, available in sizes ranging from one feet all the way to twenty feet, is available exclusively on Amazon.com, set at prices points that are being described as “remarkable” considering the high quality of the cables. According to the company, their High Performance Pro Series cables are designed with the latest version of HDMI 2.0, which allows backward compatibility with earlier versions of the HDMI as well. The HDMI cable boosts bandwidth up to 18Gbps delivering a superior consumer video and audio experience. Some of the more popular lengths range from the standard 6 feet to a more comfortable length offering extra wiggle room, the 15 feet hdmi cable. The EXHEED® Pro Series Premium HDMI Cable 2.0 cable works perfectly with the various laptops including the MacBook Pro, the Kindle Fire HD, all the major brands of HDTV's, Playstation 3, Playstation 4, the xBox and many more devices. Additionally, the company is generously giving a 50% off promo code to kick start this product. It is limit one per customer and expires June 30, 2015. Shop the EXHEED® HDMI 2.0 product line exclusively on Amazon.com. Feedback from customers has been overwhelmingly positive. Nobodies1 "Nikko", recently said in a five star Amazon.com review, "I ordered these cables for my new Sony 4K TV. I assume if a new 4K TV is future proof for streaming Internet content, then why not HDMI 2.0 cables along with it. These cables are well made. Connections are solid."